Q: What happens to assets with a beneficiary designation, like my 401k or insurance policy? The beneficiary designations control the distribution of these assets. It's important to review these designations to ensure you have the correct beneficiaries named. It's also important to consider the consequences of naming certain individuals as beneficiaries. Naming a child with special needs as a beneficiary, could lead to a loss of government benefits. Naming a child who has a drug or alcohol addiction may not be a smart choice. You should also consider the income tax consequences of naming beneficiaries on your tax-deferred plans. Q: Do I need a Will or A Trust? The most honest answer to this questions is, "it depends." Some attorneys will tell you that you absolutely need a Trust. Others think Trusts are generally unnecessary and believe that a Will is sufficient. The answer to this question depends on your circumstances and what you want to accomplish. This decision is best reached after a consultation with an estate planning attorney. In certain situations, like planning for a special needs child or owning real property in multiple states, a Trust makes more sense. Q: What happens if I die without a Will or Trust? 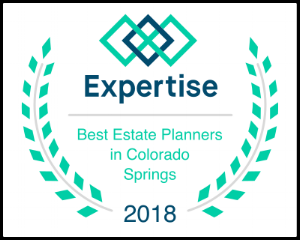 If you die without a Will or a Trust, the State of Colorado has an estate plan all ready for you. Your assets will be distributed according to statute. If you have children under the age of eighteen, you should designate a person or persons to be appointed guardian(s) over their person and property. This appointment is done in your Will. Failure to appoint a guardian will result in a court appointing a guardian for your children. You run the risk of having someone appointed to raise your kids who you would never have chosen yourself. Q: What is probate? Should I avoid it? Probate is a legal process that occurs after someone has died. The deceased person's Will is filed with the court and the court then approves the appointment of the Personal Representative (Executor). The Personal Representative prepares an accounting and inventory of the estate, provides notice to creditors, settles any outstanding debts and distributes the remaining estate assets to the beneficiaries. The probate process can take anywhere from several months to more than a year. Colorado has taken steps to simplify probate, but there may be reasons to avoid it. Keep in mind that all probate matters are available to the public. If privacy is a concern, you need to plan to avoid probate.